Implants are one of the greatest achievements in modern dentistry. Implants provide a solid platform on which a dentist can build a wide variety or restorative or reconstructive prosthetic structures (see below). Single missing tooth: so the teeth adjacent to the missing tooth do not have to be cut to accept a fixed bridge. This can be especially valuable in anterior (front) teeth where the adjacent teeth are perfectly healthy and attractive. Multiple missing teeth: implants can provide strong support to allow an implant supported bridge to restore the missing teeth; or multiple missing teeth by supporting a removable partial bridge with both fixed and removable bridges of many different designs and functions. 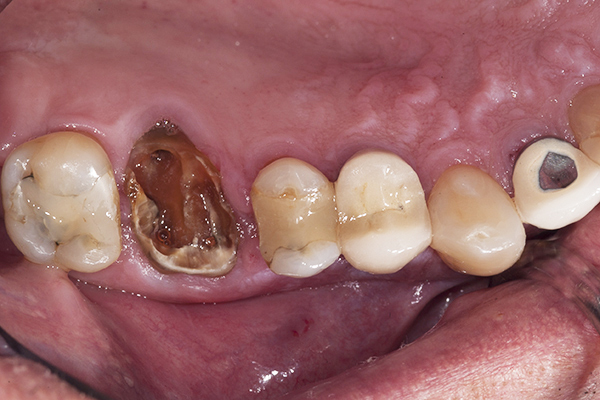 When the space between teeth becomes too long, cemented bridgework becomes less predictable. In addition natural teeth are sometimes not sufficiently strong to accomplish this. Full arch of missing teeth: 'All on 4", "Teeth in a Day", depending on many factors, as few as four implants can support an entire arch of teeth. Again, circumstances permitting, implants can receive temporary bridgework immediately after placement, along with some diet restrictions. Planning for both options requires careful attention to detail. 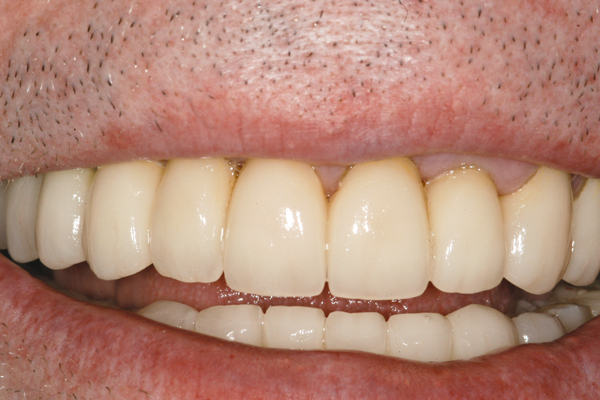 Cosmetic dentistry: implants, when combined with aesthetic porcelain crowns, can become totally invisible in the mouth, exactly replicating the natural looking tooth it replaced. Full mouth reconstruction: implants can eliminate the need for a lifetime of removable bridgework by adding 'root' structures to add support to the natural teeth that still are remaining. Orthodontic tooth movement: Implants can be used as anchors when there are insufficient remaining back (molar) teeth to stabilize the pulling forces of the orthodontic braces. Implants require a definite amount of bone to succeed. It is the integration (adhesion) of the bone to the implant that determines its strength and durability. When bone levels are insufficient, special bone augmentation procedures can create it allowing successful implant placement. Implants require a balanced functioning bite to last for many years. Since there is no ligament that holds an implant to the bone, as with a tooth, any incorrect force will be sent directly to the bone causing functional stress damage and deterioration to the interface with the implant and eventually loosening of the implant. Implants require accurate placement in all 4 dimensions to look natural. It is easy to place an implant; it is hard to place it precisely. For maximum aesthetics in the front of the mouth an implant needs to create a replication of the natural tooth shape as it emerges from under the gums. The precise size, shape and placement of not only the implant but also the abutment that creates the connection between the implant fixture and the final crown will determine exactly how well the surrounding tissues will adapt to it as if it were a natural tooth. A truly natural looking crown is a complex integration of treatment analysis, attention to precise placement with ideal tissue response and a natural, aesthetic completion of the final restoration. Dr. Prus' awareness of all these factors along with his attitude to create excellence in everything he does, puts him in an ideal position to provide each patient with the best dentistry possible. Call the Center for Dental Excellence today to find out how Dr. Prus can help you. Case Study: In the images above the patient presented with a damaged and unrestorable upper first molar which has three roots in a triangular pattern. 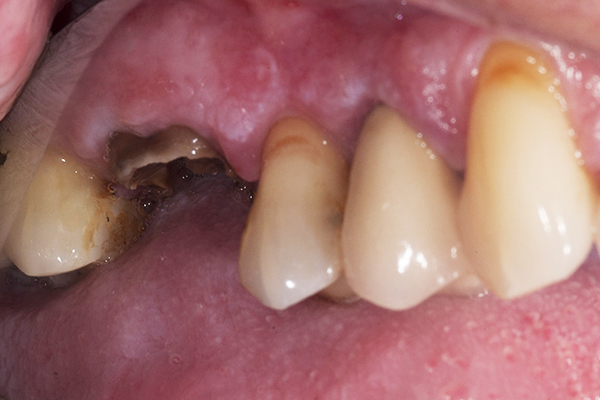 The patient preferred not to have a bridge cemented in the area because it would require that several adjacent teeth be cut down to accept the bridge abutments. The issues regarding the advantages and disadvantages of implants were all considered. The final decision was based on the fact with the implant choice, he would require a temporary restoration because the damaged tooth was in the smile zone. Because chewing forces are strong in that region of the mouth, retaining a temporary bridge without cutting down adjacent teeth for six months would have been difficult. 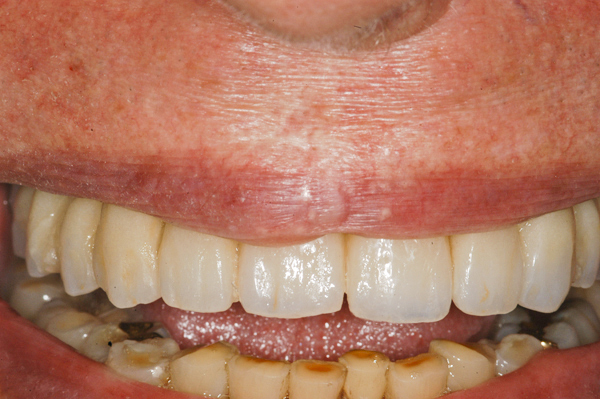 In addition the patient did not want to wait the minimum of 6 months to receive the final restoration. Cost was also an issue as he had coverage which favored the creation of a fixed bridge (cemented); plus the adjacent teeth all had worn or leaking fillings and would require crowns eventually. 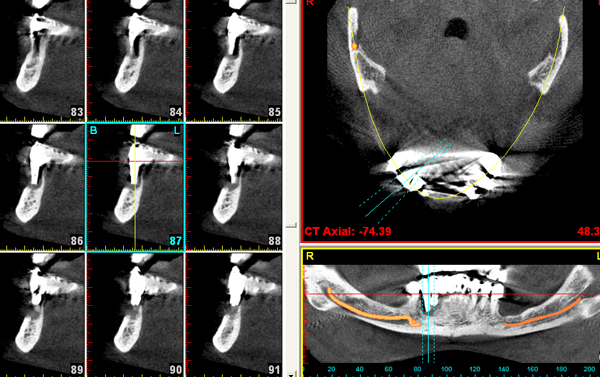 All those factors greatly increased the cost of the implant approach for this patients. It was determined that fixed bridgework would serve the patient better because all the fillings that needed to be replaced would be taken care of with a fixed bridge, and there was no long time lapse to receive the final prosthesis which was important to the patient. Implants are man-made roots. Added roots increase the strength of an area of the mouth and reduces stresses on the natural root structure in the mouth. Like natural teeth and roots, implants, when they are damaged through bacterial action, can sometimes be repaired. Implants can take 3-6 months or more to integrate into the bone. If the implant(s) is in an aesthetic zone, a temporary must be made for the missing tooth. While that is happening, the diet must be restricted. No forceful chewing on the implant area is allowed. Micro-movement of an implant while it is setting in the bone can damage the implant-bone interface causing it to fail. Dr. Prus will help each of his patients understand all the pluses and minuses of each option to make the decision that is best for them. It is all part of his attitude of relating to his patients with integrity and building a bond of trust by doing what is right for the needs, wants and limits of his patients. Go to our constantly growing Smile Gallery for more Implant case studies where you will learn what goes into each decision. You will always know you are receiving the best and most honest appraisal from Dr. Prus to solve your problem. In a great percentage of cases it is critical that a CT-Scan be taken before placement of implants. CT-Scans are taken of either/both jaws and provide the implant surgeon with vital information to precisely and definitively place each implant. The more that aesthetic demands are placed on the case, the more the requirements for precise placement increases for implants. Hand guided implant placement, especially in the front of the mouth, greatly increases the opportunity for error which, in the end, results in a less than perfect aesthetic appearance to the crown. CT-Scan computer driven technology can generate surgical guides that will precisely direct the implant into the exact location it is needed to gain an optimum natural result, eliminating human error and greatly increasing long-term success. Dr. Prus insists upon CT-Scans for all his work so he can give each patient the best possible smile. The greater the investment in any implant case, the greater the need for and value of CT-Scans because errors at those levels can be very debilitating and costly. Correcting such errors can be even more challenging.